More than 125 000 unique viewers followed the dramatic victory of Leela Chess Zero (aka Lczero or Lc0) in Div 4 of the Top Chess Engine Championship. After four round robins, Leela came on top of the division with 20.0/28 with 14 wins, 12 draws, and 2 losses. This was 1.5 points more than the second neural net in the event Deus X powered by Lc0, and 2 points more than the top traditional engine of the division Wasp. Leela Chess Zero entered the event as an absolute favorite. For the first time it had a high end GPU hardware and tests were showing that the ELO gained in the past months is good to storm through divisions and meet the top engines. However, Leela was in for a surprise as another Neural Network entered the event as well – Deus X – while the fully stable and well upgraded version of Wasp had a significant ELO gain. This situation left three engines fighting for every single point in a fierce race for only two qualification positions – one of them would have to be the unfortunate one to wait for a full season to meet the top competitors. Lc0 started with a bang, winning game after game with a few unlucky draws. Then came round 7 and a direct match with Wasp. In an equal position in heavy time trouble Lczero committed a blunder that cost it a full point with white against a direct competitor. From that point on the fight was for every single point and Lczero had to wait until the very last day of the event to secure qualification. The gold medal for Leela was hard fought and deserved. Now the authors expect a harder battle in Div 3, so they are upgrading the net adding extra ELO points. 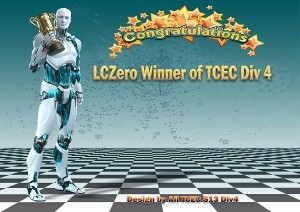 The Leela team commented, “Thank you to TCEC and Chessdom.com for hosting the event. We appreciate the GPUs given to our Neural Network. Thanks to all the Leela fans for rooting for our success and to everyone who contributed to the project in so many ways. We had tougher competition than we were expecting seeing how improved we were from last season. This season had a much stronger playing field with DeusX entrance and the surprisingly improved Wasp. Albert Silver, the author of the net Deus X powered by Lc0, managed to get the silver medal in Div 4. Deus X entered with high expectations to crush opposition, the author claimed in an interview that according to tests Deus X was at the level of Andscacs. Reality was harsher though – the computer chess sector is rapidly developing and each engine has added extra points to the field. Deus X certainly had no problem against lower rated engines. Ivanhoe lost all 4 games against Deus X, Tucano was 1,0/4, and Chess22k was 0,5/4. However, the stronger opposition made Deus X “sweat”. It always entered the middlegame with presumed advantage, and rarely it could defend it. Deus X achieved only draws against Rodent and could not overcome the direct competitor Wasp, scoring 1,5/4. It all boiled down to the last game, where Deus X met Senpai with white. Up to that point the neural network by Albert Silver had only draws against Senpai and a win was the only result that would put him through the division – another draw would eliminate it on tiebreak (direct encounter with Wasp). Deus X followed the same pattern, gaining advantage in the middlegame. It was not clear whether this is a win or not up to move 30, where black became overextended in defending the kingside and Deus X finally managed to break through and score the important victory. The performance of Wasp was brilliant. While Leela played at the expected strength and Deus X under its expected strength, Wasp managed to get a performance of +273 ELO above expectations. This put the excitement in Div 4 until the very end. The progress of Wasp and the bronze medal have earned it an invitation for TCEC Season 14. Rodent and Senpai were the top engine of the rest of the field. It is the second season of Rodent at TCEC and the strength of the engine by Pawel Koziol is increasing. Still, it was a big step to the medal positions, finishing 5,5 points behind Wasp. For Senpai this was probably the last season in TCEC, except if there is no update to the smp of the engine. Chess22k was the debutante in the season and managed to get 6th position ahead of Tucano and Ivanhoe. 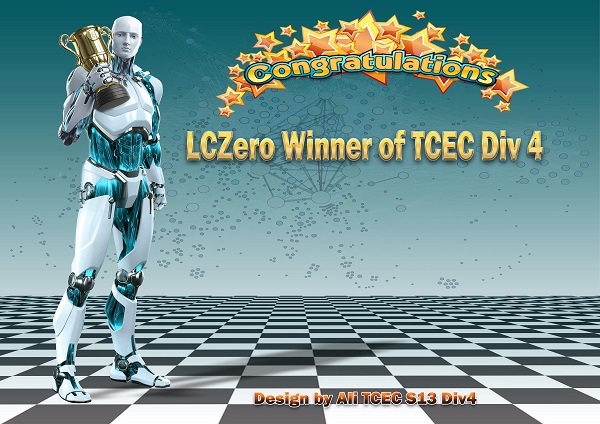 Division 4 broke all records for a TCEC lower division competition. The viewership numbers were at the level of Premier Division with 125 000 unique IPs visiting the website in a 7 days period. To this we add ~250 000 views of the Twitch TV chess channel and more than 100 000 messages published in the chat. Div 4 saw the entry of a new neural network – Deus X by Albert Silver. Silver’s net was powered by Lc0′s program code, differentiated from Leela’s entry by its being a supervised-learning neural net built with millions of human games. The unexpected entry of Deus X and the relatively little credit given to the Lc0 team in his pre-season interview provoked a serious debate which escalated to heated discussions among the fans on uniqueness of engines vs uniqueness of NNs. Despite the controversy that followed the entry of Deus X, we at TCEC believe that neural networks powered by Leela (or other binary code developed in the future) offer tremendous potential for the computer chess sector. This is shown by the extraordinary strength and style of play the neural nets have already demonstrated in the last few weeks of competition. It is undoubtedly true that the binary used to run Deus X is the same as the one of Lc0 (including engine, MCTS implementation, batching support, cudnn evaluation, movegen, uci support, optimizations and debugging, training script, both for supervised and unsupervised data), but there is also no denying that the neural network submitted by Deus X’s developer – based on supervised learning – represented a worthy experiment and the tangible realization of innovative ideas. TCEC Season 13 is an experimental season and will serve as stepping stone for further competitions. For next season fair (and practical) rules will be put in place regulating the entry of neural networks to TCEC competition. Definitions of unique, zero, non-zero, supervised, hybrid, and other types of engines and Neural Networks are needed and such will be coined with the help of professionals in the field. It is our contention that all parties should adopt a more visionary perspective; computer chess is undergoing something of a revolution and the community needs to think dispassionately about how to move forward with competitions such as ours. The show goes on this Saturday afternoon, August 11th. Join us for the advance of the NNs with live games and chat on the official website.